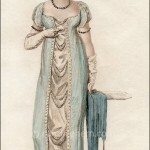 Fashions of London and Paris, December 1807. 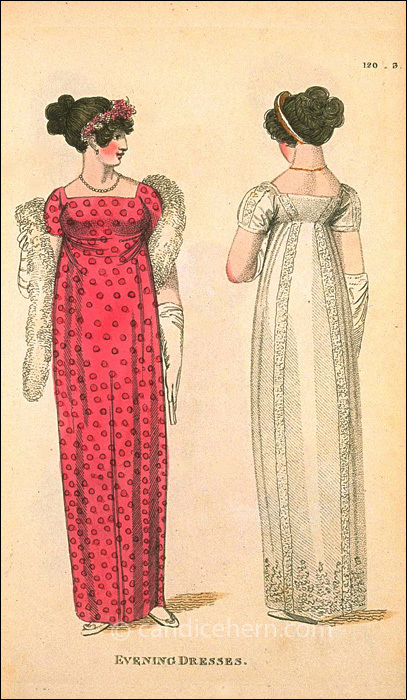 The lady in red wears what we might call a boa, but was known as a tippet at the time. It is not described in the description, but looks as if it might be made of swansdown. 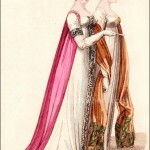 “TWO FULL DRESSES. Fig. 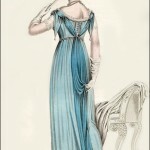 1.– A dress of amaranthus-coloured muslin, spotted or plain, over an underdress of white satin or sarsnet; the train about half a quarter on the ground, trimmed with rich lace; the body made quite plain; the sleeves rather full and trimmed with lace. The hair dressed with a wreath of flowers the colour of the dress. Cornelian necklace. White gloves and shoes.